Publicola adds that Rasmussen continues to feel the situation out and hasn’t yet formally introduced the proposal. In December, CHS reported that city officials were again coming to Capitol Hill to discuss microhousing developments — one of a handful of banes of existence for groups seeking to slow development like the Capitol Hill Coalition and Reasonable Density Seattle — even as yet another project began in the neighborhood. CHS documented the loopholes that makes the projects possible, mapped the projects underway around the Hill and taken you inside the small studios. To date, the City of Seattle has recorded applications for more than 40 microhousing projects in the city — 15 of them on Capitol Hill or very near its edges. We’ve introduced you to the community groups pushing back — and the developers who are pushing the trend forward. The Capitol Hill Community Council has come out in support of a moratorium until review requirements are strengthened. Previously, chair of the land use committee Richard Conlin has said the City Council wasn’t ready to take action to halt the developments while more stringent review processes were put in place. Thank god there is at least one City Council member who may get actively involved in this important issue, and who has the courage to push back against the “head-in-the-sand” stance of Richard Conlin, who stubbornly refuses to consider a moratorium. I hope Tom will decide to at least hold a Council hearing, and then he and other Council members will get an earful from community members. At the very least, the loophole allowing developers to claim they are building “6-unit boarding houses,” when in fact they are 48 unit buildings, must be closed…and when this happens environmental/design review (and hopefully at least some parking requirement) will be mandated. Fifteen apodments on Capitol Hill is enough, already! The plot of land at 13th and Mercer is so small, have no idea how they will fit 56 units on this property unless it’s a mid-rise building. The 56 unit aPodment building on 13th and John sits on a much larger piece of land. I live on 14th and Mercer so this should be interesting to see. While it would be great if it’s never built but I’m not optimistic. I’m all for affordable housing but not cheaply built micro-housing that is crammed in any available nook. We can’t simultaneously drive our priuses and pass property tax levy after levy and pass our shopping bag taxes and then expect everyone to live in a huge north capitol hill home. Seattle is getting more and more expensive. Wages and jobs are under pressure for most folks. Yet we want density. We want environmental stewardship of our beloved city. But not when it impacts our parking spot. These apodments are a great service to people. Affordable housing and density supports the very values most of the readers of this blog claim to be in favor of…until it’s inconvenient. Nice footwork on this issue Justin. You don’t get it. It’s about responsible development and not circumventing environmental and design processes. Developers found a loophole and residents are asking for that loophole to be closed so all construction projects undergo the same review processes. Equality, its a great thing and everyone wins. Finally a little pain being felt by you that we in rural Washington have had since the beginning. It’s about property rights- and now you see what it feels like, except you’re complaining about someone else’s property being used as is recommended in GMA- voted on and pushed by your region and politicians of Washington. ADPODments and their ilk should not be eligible for RPZ passes. I just saw this comment on SLOG and I agree. Want to shove 48 people into a space that really is meant for 8 or 10? Fine, but you don’t bring your car period. Oh, and the developer needs to provide an outsize area for recycling and trash so that the waste from 48 people isn’t overflowing onto neighboring property. Which it is. Some of these units are actually pretty nice and well thought out. That said, cramped, tiny spaces like these raise uncomfortable questions about what we are willing to put up with. What will the next economically justified step toward not honoring and valuing the quality of life that drives people to live here be? Dormitories with bunk beds billed as efficiency units for a mobile workforce? Developments like these are a symptom of a larger social problem, not a solution to it. They should be very carefully permitted, if at all. Thanks for keeping on this story. Keep telling yourself what you need to justify your classist resistance, lele99. If calling me “classist” makes you feel better about yourself, then knock yourself out with name-calling. It’s pretty sad when developers troll blogs to bash Capital Hill residents. Just as sad as when they stock Land Use meetings with their staff so they’re not alone. We want density? Maybe you do. I do not. I’m also somewhat offended that you seem to think that everyone who reads this blog shares the same opinions on which path our city should take. Sure, continue density in the dense part of the city. That is not the entirety of the Hill. We have a generally beautiful city which we should preserve. According to you I guess we should tear down our quaint neighborhoods and houses because they aren’t dense enough for you. If you are so in love with density and concrete then please move downtown or move to Manhattan. I don’t know where you moved here from but please stop trying to “improve” our neighborhood by tearing it down and putting up a bunch of ugly high-density housing which you have made clear you favor. It’s apparently about being totally ignorant. You do understand that restrictions on land use are a limitation of property rights, yes? And that the people protesting apodments are, in effect, calling for a tightening of those restrictions? if your voice fights it, as opposed to help guide it, it will come at you twice as hard. increased density is not something you can avoid. it is inevitable. it is going to happen. no. matter. what. so figure out how you can live with it. and if you can’t, then city living is probably not for you. and my one rant regarding the density naysayers is that for every no please give us a yes. in other words, a workable solution to increase density (read = affordable housing) on the hill. bitching about how much you hate it doesn’t move us forward. Unfortunately, there is plenty of room on that property to have 56 units of microhousing, as each unit is extremely small. No doubt the developer will claim it is a “7 unit boarding house” in order to avoid design/environmental review and some parking requirement…..UNLESS Tom Rasmussen moves forward and is able to pass a moratorium on any more apodment development. I agree with “etvj.” It is quite reasonable to favor increased density and oppose apodments in residential streets at the same time. I have no problem allowing some (not an unlimited number) apodments in commercial areas, or in some mixed commercial/residential areas, but I think they should be kept out of purely residential areas, because they are just not aesthetically compatible in such areas, and because of parking issues. Instead of microhousing, I think that our model to increase density/affordability should be the excellent developments done by Capitol Hill Housing. I am sure you’re right. They will make it fit somehow. Any housing that goes on that lot will be miserable. Constantly in the shadow of the 11 story SHA’s Capital Park building on the South side of lot which blocks most of the light. It is too bad SHA didn’t buy the land and install a small park. As shocking as this flagrant flaunting of Safety and Livability standards are, it is the City Council’s reaction that has been truly shocking. Rather than stepping in to clarify this issue and stand up for fairness, clarity and the citizens who elected them, the Council has basically said “let’s wait and see”. Shocking. residences near Broadway, and the still troubling easing of what developers need to do to meet the Green Initiatives Challenge (letting developers circumvent certain building codes) – a move that has garnered opprobrium from the folks who started the Green Initiatives. I am asking you to please stop apodments. To stand up for the citizens and help to improve the standing of our besmirched Council in the eyes of Seattlites. I am surprised that Seattle folks get caught up in the MicroHousing issue as an “affordable housing” issue. Wake up. 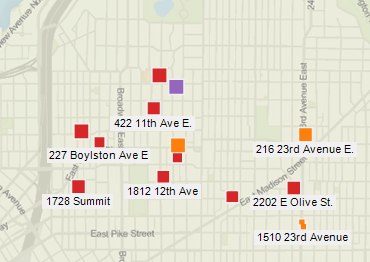 These are east side developers that are making a ton of money. This is a for profit venture, not an altruistic one. I looked at 10 of the apodment buildings in search of an apartment and the rental managers Jim and Alex couldn’t show me ONE unit at any of the claimed “starting at” prices ($495/$595/$600) these prices are advertising scams. I was shown one shoebox at $700 and many at $900. I then found, several studios on Capitol HIll for $900. And rented one with a kitchen, a view and proper emergency exits. There is already a lot of existing housing. Furthermore — why be afraid of a Moratorium? We have to live with development choices for hundreds of years. Slowing down the process, examining it clearly is the right way to plan a city. Taking into consideration residents who already live and work here, the impact on density and the neighborhood is important. Bottom line: slow down. The developers have pushed through dozens of buildings without any design review. Unfair. Not only to the neighborhood but to other developers following the rules. Moratorium is the least that should be called for until the city can catch up and DPS gets its zoning codes straight. Classist resistence? Are you saying the unpaid, grass roots organizing of residents on Capitol hill are classist? The folks who have lived here and cared about the community for years as owners, renters and citizens? What about the East Side developers who are paid to shove “affordable housing” marketing down your throat while they make a bunch of money? The developers have lawyers, lobbiests and an interest in the bottom line. Wake Up.